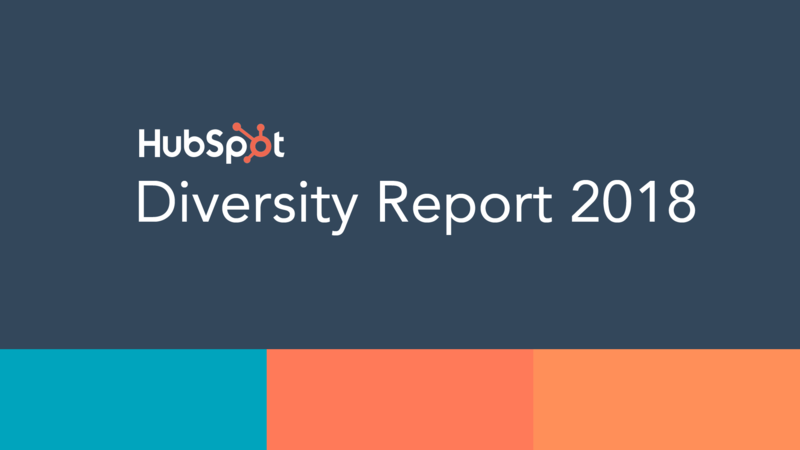 One year ago, HubSpot released its first-ever Diversity Data report, joining companies like Apple, Google, and Intel in sharing a snapshot of the composition of our company by gender, ethnicity, and age, along with our plans to make HubSpot more diverse and inclusive as we grow. Gender diversity on the HubSpot board: This fall, HubSpot joined just 20% of companies with three women on our board with the appointment of Jill Ward, formerly of Fleetmatics and Intuit. In addition to moving the needle on our own board, we hosted events throughout the year focused on helping more women secure board seats and a step-by-step guide to joining boards to help other women and companies move the needle on gender diversity. Gender diversity at the vice president level: 46% of our vice presidents company-wide are now women, a 20% jump from last year. Across the company, 45% of managers and up are female. We’ve accomplished this goal through a combination of internal growth and external recruiting efforts, and are proud to have made meaningful progress at a senior level in the company as part of our stated strategy to improve gender diversity at HubSpot long-term. An 11% increase in ethnic diversity in engineering: Our technical roles at HubSpot primarily reside in two teams — our business enablement team and our product and engineering team. Both teams saw an increase in ethnic diversity (see notes on definitions and terms included in the attached PowerPoint for clarity on how we calculated these numbers), with BET at a 7% increase and product and engineering at an 11% increase. Expanding our offerings for working parents: In January, we announced that we have increased our family leave offerings and as a company will now cover a significant portion of the cost for egg freezing, in addition to our existing fertility support through our medical coverage. This initiative, combined with our commitment to workplace flexibility and the accompanying employee resource group, ParentSpot, represents a huge opportunity. We believe it will continue to help us attract and retain top leaders who wish to grow their professional impact while also growing their families. Doubling down on what worked: We had a few clear plays that worked within teams or locations, ranging from teams implementing the Rooney Rule beyond senior roles to include managers and individual contributors, to our focus on targeted sourcing and events for both Latinos in Tech and senior women in tech. We’ll be using that data and context to inform our sourcing, events, retention, and growth strategies to make HubSpot more diverse and inclusive as we grow. Creating shared employee resource group sponsorship models: Last year, employee resource groups were run entirely out of our people operations team, which has performed well. But for this year, we’ve recruited executive sponsors for employee resource groups outside of people operations to give senior leaders more ownership of inclusion activities and drive leadership awareness and participation in key events. We’ve also built peer advisory boards, listservs, online resources, and Slack channels for intentional and effective communication and community building. Lastly, we’ve added employee resource group messaging to our onboarding process, so new and veteran employees alike can actively participate in our inclusion efforts. To learn more about the progress we made and see our plans for this year, check out the full announcement from Katie on Medium and read the full deck on SlideShare. Interested in joining the HubSpot team? Learn more about our culture and see open positions here.